An interesting mix: Richard Smith grew up in England, and Jim Nichols was raised in Virginia. What brings them together is a common love of Chet Atkins' guitar style. Picking up the guitar at a very early age, both learned their craft by studying the music of Chet Atkins and Jerry Reed. Jim and Richard first met in 1992, and ever since then they've enjoyed performing together, blending each guitarist's unique interpretation of their musical mentors. Tracks cover the full spectrum-- from classic Atkins and Reed compositions to jazz and pop standards. Richard plays nylon string on all songs, while Jim alternates between acoustic steel strings and electric guitar. On each tune, guitar fans are treated to both world-class fingerstyle technique, and dazzling, inventive single-note improvisation. please click here for our e-mail. 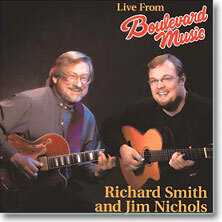 After hearing Morning sing on two tracks of the Richard Smith/Jim Nichols CD, many of you wanted to hear more. 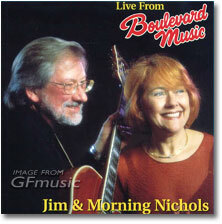 Ten of the CD's 16 tracks showcase the unique blend of brilliant guitarist Jim Nichols and engaging Trad-Jazz/Pop singer Morning Nichols. Performing together since 1982, Jim and Morning give a tighly polished performance that's full of musical surprises. Every vocal track features a great fingerstyle solo by Jimand as any Atkins' fan would expect, Drive In, Swedish Rhapsody, One Mint Julip, Yankee Doodle Dixie, Main Street Breakdown, and Chet's Medley are featured instrumentals. Very highly recommended!